A town with cattle-ranching roots branches out. Tim Hauserman is a contributor to Writers on the Range, the opinion service of High Country News. He lives in California. Sierra Valley lies just an hour north of Lake Tahoe, but it feels a million miles away and in a different century. Tahoe is a recreational playground full of jet-setters and wealthy second-home owners. The Sierra Valley is rural and huge, stretching over 130,000 acres, yet only 1,500 people live in the entire valley. 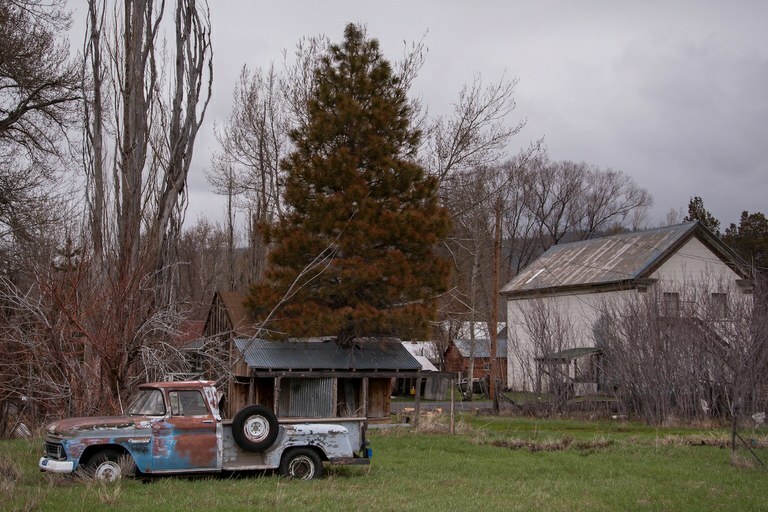 Now, this small community in Northern California is changing in a very big way. Lately, it has been expanding from its cattle-ranching roots into a variety of creative outlets. There is now an on-the-farm Farmers Market at Sierra Valley Farms every Friday in the summer, and bikers and ranchers get together every June for the wonderfully named “Tour De Manure” bike ride, which benefits the Sierraville Fire Department. 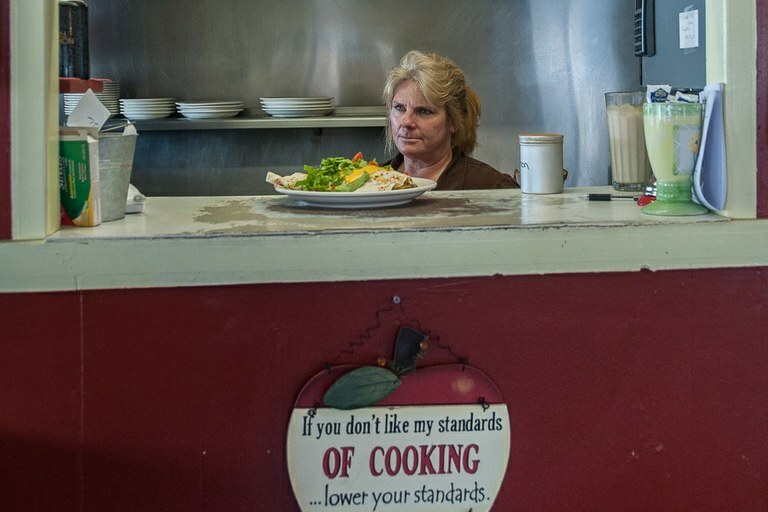 A line cook at the Sierraville Kitchen in Sierra Valley, California. Then, this Sept. 30, an “Art and Ag Trail” event brought together ranchers and artists. About a dozen ranches opened for tours, and visitors got to see — and feed — a variety of the animals as well as to meet local artists who were displaying their wares. In addition to cattle, visitors saw alpaca, sheep, goats, horses and even yaks. And they watched as spinners turned animal fur into clothing much the way it’s been done for centuries, while artists worked on images of the Sierra Valley life, and jewelry makers, woodworkers, candle makers and potters all showed how they make their wares. The day’s festivities concluded at the Grange Hall in tiny Vinton, population 454, which was packed with over 200 ranchers, artists and writers. The event raised money for the Art and Ag Trail and the local Cattlemen’s Association. It also included one of the best small-town raffles I’ve seen, but what really captured my attention was the live auction. In ranching country, rusty old tractors and long-dead farm implements often dress up the entrance to local properties. A variety of those ancient items were dragged up from people’s yards and brought to the front of the stage. Surprise big sellers included a milk jug that had seen better days, a rusted tractor seat, some old spurs, a cow’s skull, and a no-longer functioning wheel from a hay rake. An abandoned truck in Sierra Valley, California. The old stuff sold for hundreds of dollars — sometimes as much as $500 — and often, the successful bidder handed the item back to the auctioneer to sell again. There was a spirit of giving that I’ve rarely seen, and it was done quietly and sometimes anonymously. Roberti said before the auction that the cattlemen’s group was worried that it would have to drop one of its high school scholarships this year because of a lack of funding. The success of this fundraiser will allow that scholarship to continue. “And for those of us in the ag community, it’s good to meet the artists and see we have things in common. At this event, they get to tell their story and we get to tell ours,” said Roberti. People have been ranching in the Sierra Valley for over a century. It’s good to see that historic ranching opportunities are thriving, along with the artists who come to this area for its peacefulness and big-sky landscape. For me, Sierra Valley has always been the place where I can get on my bike and enjoy hours of solitude as I ride through the marshy landscape to see hawks, deer and sandhill cranes. And now I know that the quiet ranch houses I pass are not just the base for the business of raising cows. They are also part of a strong community that cherishes art as well as its own local, living creation.